As the manufacturers of Acraglas, we cannot help but be very proud, too, of the many individual shooters and teams who have won big bore regional and Perry matches with Acraglassed guns ... and of the hunters who have sent us “before and after” targets made when sighting in their game rifles after using Acraglas. Acraglas shrinks less than 1⁄10th of 1% when hardening. This is very important to you as a shooter, for the tighter your bedding job, the better the job. It must be remembered, too, that many of the plastics will shrink more than 5% when hardening, thus canceling their true values as accurizing materials. So perfectly does Acraglas fit your barrel and action that any stamping marks in the steel will also be there in the Acraglas ... impossible to “Bed” any closer. Acraglas actually strengthens your stock because of its own great strength and resistance to breakage or warpage! Acraglas is acid proof, waterproof, has superior insulating qualities, resists alkalies and will not rot or deteriorate. It is quite well known that many of the so-called “plastic glasses” do deteriorate and products made from them are only guaranteed 5 years. Acraglas is highly resistant to impact and will not dent. Should it ever be damaged, or if an improper job is done the first time, it can easily be corrected or mended by using the same materials as in the Kit. Thus, it makes the perfect recoil shoulder. Unlike paints or air drying plastics, Acraglas hardens by chemical action. So, a hard surface indicates a hard interior ready for finishing. The mixture becomes hot before reaching setting temperature. It then “kicks over” and begins to harden, reaching full hardness in 48 hours, altho’ it can be worked, sanded and finished before then. Acraglas has a shelf life of over 5 years! Acraglas has been so compounded by our research engineers that you have ample time to properly seat the barreled action in the inletted stock before it starts to harden. Therefore, when using it you do not need to become nervous and rushed, but can take your time and do the First Class Job you are capable of doing. Being a superior bedding compound, you get a double- barreled benefit when using Acraglas: - An excellent bedding job that does not carry the stigma of “plastic bedding” and you have concentrated your real efforts on accurizing your gun - all at the same time! For your own enlightenment you should check among your shooting friends and note how many are proud of their guns being Accurized with Acraglas. Acraglas completely seals the inletted side of the gun stock against all moisture, gun oils, solvents and sprays. Moisture being absorbed by the stock can cause the finest woods to warp or twist, forcing the gun to shoot different groups on different days. Oils and solvents will eventually make the most beautiful of woods dirty looking where allowed to soak in and, in rare cases, actually ruin the wood. Acraglas has another feature that is strictly a side benefit - but, one our gunsmith customers have found out for themselves and use extensively. The bonding strength of Acraglas is phenomenal - will actually stick “anything to anything” (except certain poly-plastics). The letters in our files make one shake his head in wonder. It seems our gunsmiths have repaired everything from false teeth, toilet bowls, pipes, chairs, cribs, cars, radios, TV’s, skis, sleds, tables, flintlock rifles, caplock rifles and modern gun stocks without number. What it amounts to is this: You name something that has been busted and one of them has undoubtedly used Acraglas to fix it! But, we play this down. We are not in the glue business. There are a jillion glues but only one Acraglas! Our traditional Release Agent and our easy-to-ship, Non-Flammable Release Agent selectively lets Acraglas bond to the stock but not to the barreled action. Both products present nearly indentical physical characteristics, and are applied in exactly the same manner with no noticeable difference in dry time. Both form a smooth, vinyl-like coating between the bedding compound and metal. Non-Flammable Release Agent is a non-flammable, non-hazardous formula that can be transported by air, immediately upon request, safely and legally within and outside the Continental U. S., so there’s no more waiting for ground shipments to arrive when you need an Acraglas kit or extra release agent in a hurry. STOCK MANUFACTURERS - For special custom accurizing jobs and for resale to dealer and retail accounts. PROFESSIONAL STOCKMAKERS - For obtaining skin-tight bedding around receivers, at the chamber on the barrel and at the forend tip on certain jobs. GUNSMITHS - For the complete gamut of stock work - the complete inletting job, the accurizing of an erratic shooting gun and for the super-duper stock where the same techniques are used as by the fulltime stockmaker. GUN HOBBYISTS AND BUFFS - To accurize their present guns or to bed and accurize guns they are stocking; also, to simplify bedding barreled actions into inletted stocks purchased from stock manufacturers ... a great boon for the man who likes to do the job himself - and wants the best results. Acraglas in itself is amber-clear. To make it match your stock - black or brown - we furnish two special, acrylic dyes with each Kit. With them you can color the Acraglas mix to blend properly with the color of your individual stock - wood or synthetic. The brown dye nicely matches “normal” walnut but if your stock is exceptionally light walnut, or made of maple, myrtle, cherry, etc., you may want to leave out the dye for a closer match. Just remember, the color you see in the cup will darken somewhat when the Acraglas is in the stock. But, you don’t have to match the color, many shooters like to create contrast at the joining of barrel and stock to add a point of distinction to their gun and make sure others know they’ve taken the time to do a first-rate glass bedding job. Complete, easy-to-follow Instructions are packaged with each Kit. These tell you how to mix and use. FOLLOW THEM CAREFULLY. 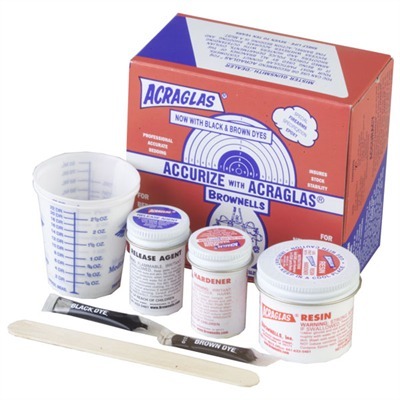 ACRAGLAS KIT - 2 fl. oz. (59 ml) Resin, 7⁄8 fl. oz. (26 ml) Hardener, 7⁄8 fl. oz. (26 ml) Release Agent, Floc, 2 Mixing Cups, Mixing Stick, Brown Dye, Black Dye enough to bed 2 Rifles. Complete Instructions. ACRAGLAS SHOP KIT - 28 fl. oz. (828 ml) Resin, 7 fl. oz. (207 ml) Hardener, 3 fl. oz. (89 ml) Release Agent, 8 oz. (227g) Floc, 24 3 oz. capacity Mixing Cups, 50 Mixing Sticks, 5 Packets Brown Dye, 5 Paks Black Dye and Instructions. Size: 120 oz., 30 oz.